MADE IN THE U S A! The Stage 2 kit includes upper and lower front A-Arms, heavy duty UMI sway bars with new end links and greaseable bushings, UMI monotube gas shocks for all four corners, UMI premium lowering springs, rear tubular upper and lower control arms, replacement rear end housing bushings and heavy duty tubular frame braces. Also includes all new Grade 8 hardware with locking nuts to complete the installation. This kit will make any classic cruiser feel like a modern day muscle car! UMIs Stage 2 may be the entry level complete kit but it isnt entry level performance or entry level quality. Perfect for the weekend warrior looking to go for a back road cruise, perhaps hit the drag strip or even an auto-x. As with all UMI Performance products, this kit is 100%25 Made In USA. #4031- Tubular lower front a-arms with polyurethane bushings. #4033- Tubular upper front a-arms with Delrin bushings. #4035- Heavy duty 1-1/4 front sway bar with new bushings & endlinks. #4034- Solid 1 heat treated rear sway bar. #4051 - 2 lowering springs, linear spring rates (530 lb/in front, 130 lb/in rear). #4015 - Tubular rear lower control arms with polyurethane bushings. #4016 - Tubular rear upper control arms with polyurethane bushings. #4028 - Tubular frame braces with hardware. #3000 - Replacement rear end housing bushings. #4004 - Front upper & lower Grade 8 hardware kit. #4001 - Rear control arm Grade 8 hardware kit. #S41030- UMI monotube shocks, designed & tuned for optimum ride quality combined and performance. Small Block and LS: Small block motors, Pontiac 400 or Big Block with aluminum heads and intake tend to sit level with this kit. Lightweight LS may require spring trimming. Big Block: An additional 1/4 front end drop may occur on vehicles with full weight big block engines. 64-72 GM A-Body Tubular Front Upper A-Arms, Delrin Bushings. The relocated ball joint plate on these a-arms permits up to six degrees caster without excessive shimming. Expect improved steering feedback courtesy of increased caster and a precise feel due to the UMI built Delrin bushings. Features include greaseable, low deflection UMI designed and manufactured Delrin bushings, chromoly cross shafts, improved header clearance and polyurethane bump stops. These track-tested, jig built DOM a-arms are supplied with a durable gloss red or black powder coat finish which guarantees your performance parts stay beautiful on your street car, drag car, autocrosser or Pro-touring machine. Relocated ball joint pad for increased caster and improved steering feel without excess shims. CNC machined ball joint mount & tubing radiuses. Robust tubular design bent on a programmable tube bender. TIG welded for superior strength and clean looks. 4140 chromoly cross shafts, CNC machined & zinc plated. UMI built, greaseable & fluted CNC machined no deflection Delrin bushings. Direct bolt-in compatible with factory or UMI lower a-arm and factory spindle. May also work in conjunction with other lower a-arms and/or spindles. Package includes recommended alignment specs and detailed installation instructions. For even more performance, check out the P/N 4033-1 which adds the benefit of a ½ taller ball joint for an improved camber curve and flatter contact patch. Designed & Manufactured in the USA. 64-72 GM A-Body Tubular Front Lower A-Arms, Polyurethane Bushings. Tired of looking at hammered, crusty lower a-arms with cracked ball joint bosses? UMI has the solution with brand new modern tubular lower a-arms. UMI lower A-Arms are fabricated from DOM tubing with CNC machined tube ends for a precision fit. They are jig built to maintain accuracy and bolt on correctly every time. All critical areas are TIG welded for superior strength and a clean look. UMI's lower A-Arms also feature improved ball joint angle for lowered vehicles and the design provides additional tire clearance. These lower a-arms include greaseable polyurethane bushings, premium ball joints, polyurethane bump stops and spring isolators. UMI's extensive testing on the street, drag strip and skid pad ensures a quality product able to with stand all types of abuse. UMI lower a-arms are designed to work with factory springs, lowering springs and coil over kits without changing the a-arms. Designed and manufactured with pride in Philipsburg, PA - USA. Tubing is precision bent on a programmable tube bender and CNC machined for accuracy. Jig built and TIG welded for superior strength and a clean look. New premium ball joints installed. Greaseable & fluted polyurethane bushings. Polyurethane bump stops & spring isolators. Fits factory spindle & works with factory springs, lowering springs and coil over kits. Durable red or black powder coat finish. 1964 - 1972 GM A-Body 1.250 Solid Front Sway Bar. UMI Performance 1.250 (32mm) solid front sway bar is designed to reduce body roll, understeer and increase cornering capabilities resulting in a more balanced suspension. This front sway bar is over 400%25 more rigid than the factory 7/8 front sway bar and bolts directly in place with no modifications. Front sway bar is manufactured from 1.250 4140 chrome moly steel, CNC bent and formed as one piece to insure maximum strength and performance. Each kit includes new Energy Suspension end links and greaseable sway bar bushings with new zinc plated clamshells. Sway bar is available powder coated bright red or gloss black for a durable long lasting finish. 1964 - 1972 GM A-Body 1 Solid Chromoly Rear Sway Bar. This beefy 1 solid rear sway bar is designed to reduce body roll, understeer and increase cornering capabilities resulting in a more balanced suspension. This rear sway bar also works to keep your vehicle level and straight during those hard launches. UMI's sway bar is manufactured from 1 solid 4140 chromoly steel, heat treated and formed as one piece to ensure maximum strength and performance. The hot forming and heat treating process allows the bar to maintain its shape and memory longer than a cold bent bar. Rear sway bar includes new Grade 8 hardware to complete the installation. The bar is available powder coated Bright Red or Gloss Black. GM A-Body Spring Kit, 2 Lowering. A spring is a spring right? When UMI chose to manufacture their own line of springs they went all out. Designed in conjunction with a leading Sprint Cup chassis engineer, these springs are the best in the business. These front springs are wound from 5160 CrSi premium wire and feature a linear 530 lb/in rate. The rear springs are wound from 9254 CrSi premium wire and feature a linear 130 lb/in rate. These springs are suitable for Auto-x and Pro-Tour applications as well as corner carving/cruising. The ride height is engineered for a 2 lowering with standard SBC, Pontiac 400 and aluminum head/intake Big Block Chevy as well as LS power (lightened cars may require spring trimming). The front springs are also suitable for full weight Big Block applications when ¼ nose down rake is desired. They have a tough, black powder coat finish and UMI proudly manufactures these premium quality springs in the USA. Consistent rates and only the best materials (premium Chrome Silicon wire) ensure your cars sits properly for years to come. Suitable for Pro-Tour, Auto-x and general cruising. 2 Lowering with standard SBC, Pontiac 400 and aluminum head/intake Big Block Chevy as well as LS power. The UMI Performance monotube shock package is designed to bridge the gap between basic street shocks and aggressive racing shocks. The ramped up rebound curve slows body roll during transition and gets rid of that unwanted floating feeling. A high pressure nitrogen charge prevents shock fade during hard cornering and further increases performance. UMI Performance monotubes feature race proven technology with street friendly valving. UMI Performance shocks are 100%25 manufactured in the USA. Race proven construction for durability. Rear control arms are one of the most important suspension modifications that can be done to your GM vehicle. These tubular control arms are designed to give you the best of both worlds, whether your car is a weekend cruiser or a weekend track addict UMI's got you covered. The included Energy Suspension polyurethane bushings are an excellent improvement over OEM rubber bushings, while adding ride improvements they also work excellent to reduce traction loss. These control arms are a direct bolt-on replacement designed to minimize wheel hop, improve corning and help track consistency. Built using 1.625" OD x 0.120" DOM Mild Steel Tubing. CNC Machined for Precision Tolerances and Accuracy. Fully TIG and MIG Welded Construction. Energy Suspension Polyurethane Bushings with Grease Fittings. Durable Long Lasting Powder Coat finish. 1964 - 1972 GM A-Body Tubular Lower Control Arms. Rear lower control arms are a must improvement for any General Motors A-Body vehicle. These lower control arms are designed to replace your weak, rusted, factory-stamped arms, adding strength, rigidity and bushing improvement. Built using strong DOM steel tubing these direct bolt on replacements help eliminate unwanted wheel hop while improving corning and helping much needed track consistency. Lower Control arms feature CNC Machined 0.120 wall thickness mild steel tubing, fully TIG welded construction, greaseable polyurethane bushings and zerk grease fittings all combined to make the best arms on the market! 1.500" OD x 0.120" DOM mild steel tubing. CNC machined for precision tolerances and accuracy. Fully TIG welded for superior strength. Greaseable Energy Suspension fluted bushings. Durable long lasting powder coat finish. Features Reinforced Sway Bar Holes - Works with OEM Sway Bar and Most Aftermarket Sway Bars. Trailing arm mount braces are designed to reinforce the upper and lower front control arm mounts on your classic A-Body. The more power your ride makes the better chance of bending or breaking the rear control arm mounts. These tubular reinforcements tie the upper and lower control arm mounts together for added strength and driving performance. Control arm braces are manufactured from DOM steel; TIG welded and feature adjustment for a perfect fit on all 64-67 A-Bodys. Kit includes new longer Grade 8 hardware, nuts and washers. Replace your rubber OEM rear end housing with an Energy Suspension polyurethane setup. Over years, rubber OEM bushings dry rot, crack and harden, decreasing your ride quality and performance. The Energy Suspension polyurethane bushings replace the two upper control arm rear end differential bushings--the bushings that stay attached to the rear end. This is an excellent upgrade for your street or track driven vehicle. Thank you for shopping at Matts Classic Bowties. 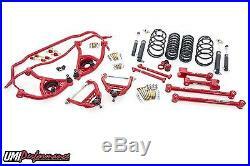 The item "UMI Performance 1968-72 Chevelle Suspension Handling Kit 2 Lower Red Stage 2" is in sale since Monday, October 31, 2016. This item is in the category "eBay Motors\Parts & Accessories\Vintage Car & Truck Parts\Suspension & Steering". The seller is "mattsclassicbowties" and is located in Philipsburg, Pennsylvania.